Living in an area that is often affected by hurricanes can be scary. Protecting your home may seem overwhelming at first. With the changing tides of hurricane season, there is always something new to keep up with. Here is a quick guide to protecting your home from the harsh storms of hurricane season. Hurricane season officially begins on June first each year and lasts through November. That isn’t to say storms can’t come outside of the season. In 2016, hurricane season got its unofficial start in January with hurricane Alex. It is important to review and update your homeowners insurance and storm insurance before the start of each season. Your homeowners insurance can vary and wane based on the cost of construction in your area each year. Being knowledgeable about these changes will help you stay prepared and informed about what you can expect from your insurance claims before you ever have to make them. Most homeowners insurances do not cover flood or wind damage. Stay informed on your policy. Be sure to purchase supplementary insurance policies that will protect you. Many storm policies require state or county approved window protection. Make sure you are covered for storm damage. Furthermore, make sure you are in compliance with all your insurance’s protection requirements well before June first so that you’re ready to face any oncoming storm head-first. According to the Florida Division of Emergency Management, installing storm shutters over all exposed windows and other glass surfaces is one of the easiest and most effective ways to protect your home. Fabric storm shutters are an innovative new approach to hurricane protection. Retractable hurricane screens are installed on your windows and patio openings. This means you have storm protection that deploys at the touch of a button. Retractable hurricane protection takes the worry out of protecting your windows. Instead of spending hours attaching plywood shutters to your windows one by one, you can spend your time getting your family safe and ready. 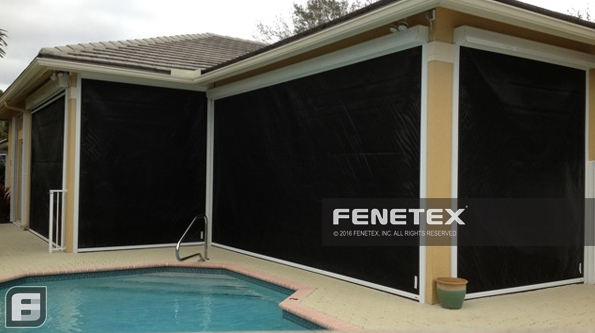 Fenetex Retractable Hurricane Screens are certified by the State of Florida and Miami-Dade county for use in the High Velocity Hurricane Zones. Our screens made from the same material as bullet-proof vests, so they’re impenetrable up to 200 mph and stronger than steel. To learn more about retractable hurricane screens and start on the path to protecting your home, contact us today!